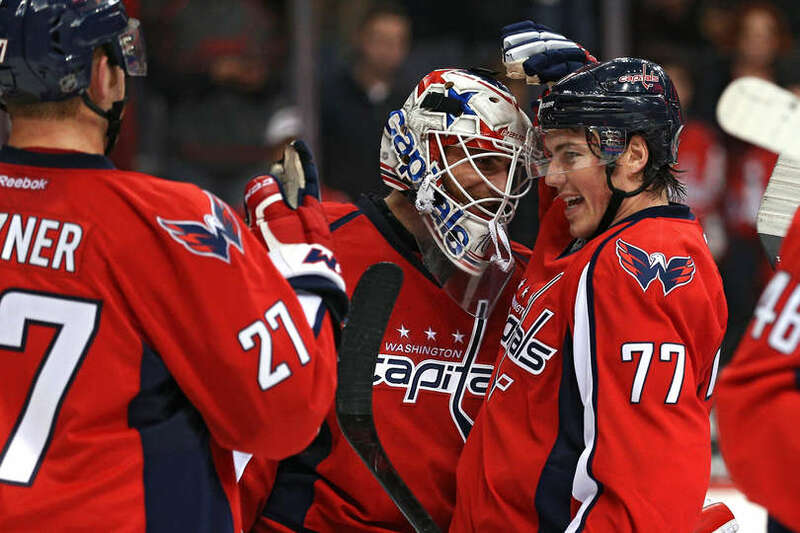 Braden Holtby was the best player on the ice, Dmitry Orlov came up with a third period goal and the Washington Capitals won for the second time on their current five-game homestand, the longest of the season, beating the Edmonton Oilers 1-0 at Verizon Center on Monday. The Capitals improved to 14-5-1 (29 points) this season, tying the team’s second best start (in terms of points and wins) in franchise history. Orlov’s goal, his second in as many games, came with just 6:32 left in regulation, as it seemed the teams would play to a scoreless resolution and need overtime or beyond to settle it. “We didn’t have much going on all night,” Capitals coach Barry Trotz said. “[Orlov’s goal] was huge, guys stepped up. I thought we managed it [the game] really well once we got the lead. We managed it much better than we managed the game in total.”Holtby won his 12th game in 16 starts thus far and recorded his first shutout of the season — and the 21st of his career. He lowered his goals-against average to 1.88 and boasts a gaudy .926 save percentage. Edmonton outshot the Caps 13-7 in the first period and led 23-15 after two. The Caps played a large chunk of the second short-handed with Nick Backstrom in the box for a double-minor for high-sticking Oscar Klefbom. But the penalty kill — and especially Holtby — did their jobs. Edmonton was 0 for 3 overall and managed just three shots with the man advantage. Hard-luck loser Anders Nilsson made 31 saves for the Oilers (7-13-1). Holtby almost wasn’t available for this one. In pregame warm-ups, forward Justin Williams backpedaled into his goaltender, who was stretching near one of the faceoff circles. It’s good for everyone Holtby and Williams were able to laugh it off. Capitals defenseman Brooks Orpik missed his sixth consecutive game with a lower-body injury. Forward Andre Burakovsky was a healthy scratch for the second consecutive game. Alex Ovechkin led all skaters in hits (7) and led the Capitals in shots (5). John Carlson recorded a season-high seven blocked shots for Washington. Nicklas Backstrom won 14 of 21 faceoffs (66.7%). NEXT GAME: Wednesday at 7 p.m. against Winnipeg at Verizon Center.